Many people took notice when the town of Flint, MI, declared a state of emergency after contaminated drinking water caused elevated levels of lead in 5 percent of the city’s children. More recently, and closer to home, there were elevated levels of lead found in school water fountains in Newark, Paterson, Pascack Valley and Leonia, NJ. These stories have brought attention to the typically ‘out of sight, out of mind’ water infrastructure utilities. 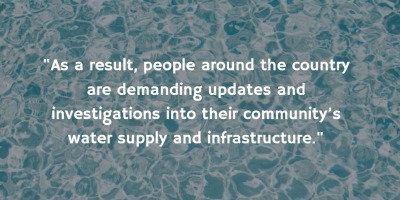 As a result, people around the country are demanding updates and investigations into their community’s water supply and infrastructure. Understanding the potential problems of our water system begins with understanding the system itself. Lead, from the Latin plumbum, has been a main component of societal plumbing systems for many centuries. In New Jersey, most water infrastructure from the early 1900s was constructed using cast iron and had a lifetime expectancy of 120 years. In the 1950s, steel was used, which had a lifetime expectancy of 50 to 70 years. Now in 2016, we are facing an issue where these two materials used for infrastructure are simultaneously reaching the end of their useful lives. The constant flow of naturally corrosive water through these pipes can cause the pipes to break down and carry some of the metals (i.e. lead) along in the water supply. Corrosion of the pipes can be slowed with inhibitor chemicals that ‘buffer’ the water as it passes through pipes and reduces the contact water has with pipe walls. While the most obvious solution would be to replace the aging infrastructure, the costs would be billions of dollars. Asset management and inventorying have become priorities among utility providers and the New Jersey Department of Environmental Protection (NJDEP), especially with the increasing threat of violent storms in the area. The state is in the beginning stages of creating a standardized asset management plan for all utilities to complete. The other piece of the puzzle is funding improvements. Water rates have continued to increase, and part of the reason is to provide the utility companies with funds to back their capital investment/infrastructure projects. For some public systems, saving up for future investments isn’t always enough. Peggy Gallos of the Association of Environmental Authorities (AEA) discussed changes in legislation that have allowed local governments to sweep up to 5 percent of funds from a publicly owned utility within their jurisdiction. Funds that could have been used by utilities to upgrade aging infrastructure are instead being used by local government to avoid or minimize tax increases. Furthermore, after some public systems have been ‘dissolved,’ those funds saved for future capital projects also seem to disappear. Gallos suggested that more limits be placed on these funds and the transfer of funds, so they can still be used as intended -- to improve our water infrastructure. Utility companies also face a tricky problem; as water conservation is practiced more regularly by customers, with financial savings being a big motivator, the amount collected by the utility companies’ drops. For example, in 2012, when water supply issues in Hammonton led the water department to significantly raise rates, residents responded by vastly lowering their consumption volumes; but that also meant less money being collected by the water department for infrastructure projects. These financial issues have led many towns and companies to adopt ‘fixed rate’ models to ensure they can still afford to make needed capital improvements on their systems. The water supply in our state has also faced some stress due to the ever-growing population. There are two “Critical Areas” which house aquifers that serve as a water supply source to 10 different counties in the state. ‘Critical Area 1,’ which serves Ocean, Monmouth and Middlesex counties, had seen large draw downs on the aquifer and salt water intrusion due to the increased usage in the 1990s. An effort was made to reduce usage in this area and it worked quite well; the 2006 USGS survey showed the aquifer had recovered to levels not seen since the 1960s. ‘Critical Area 2’ serves parts of Ocean, Burlington, Atlantic, Camden, Gloucester, Salem and Cumberland counties. Although commercial and industrial water usage in this area has gone down, the overall volume used has stayed the same because residential usage has increased. At the recent panel discussion “Drinking Water, At What Cost,” Carleton Montgomery of the Pinelands Preservation Alliance (PPA) offered some suggestions for protecting our water supply. First, we should better protect our headwaters and wetlands. Instituting larger buffer zones (300 ft.) throughout the state would help lower nitrogen concentrations that result from fertilizers entering the water source areas. He also proposed that municipalities purchase Open Field/Green Field areas instead of building new AstroTurf-type projects. Another suggestion was to practice more sustainable pumping from our source areas. Montgomery said many studies focus on the effects of “adding one more well,” instead of using data to better use our current wells. The harmful effects of over-pumping can be seen in the 800-ft. sands source area in Atlantic City, where the depths to water levels continue to drop without recharge and create a ‘cone of depression.’ Hammonton residents have seen their shallow source wells drawn down up to 1 foot in recent years with no recharge. Van Abs added that as a state, we use far too much to water our lawns in the summer. NJ statistics show the average person uses approximately 30 gallons per day; in the summer watering months that number goes up to 200 gallons per day – a 600% increase in volume per person. New Jersey’s Water Supply Master Plan is now nearly 20 years overdue. The last master plan was released in 1996. A revised plan has been completed by NJDEP, but has not been released by the Governor’s office. Many activists are well aware of this and have stressed that ‘at risk’ areas from the 1996 plan have seen no lessening of development since the plan’s release. It is anticipated that the NJ Pinelands Commission will release a study of water resources in the Pinelands that will outline policies impacting water supply, water withdrawals, and stream and river flows in late summer 2016. When released, these resources will greatly aid in the protection and sustainability of the state’s water supply.